Reminiscent of a classic Chanel design, but still uniquely its own. 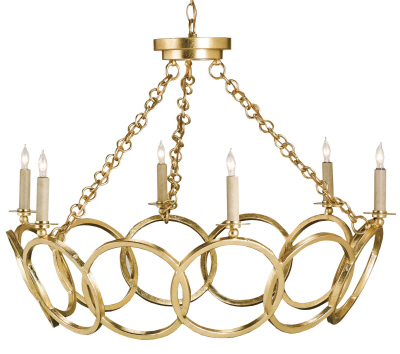 The Orli is made of wrought iron and is finished in very "on-trend" gold leaf. Measures 32" in diameter x 24"H. A lovely addition to any room of your exceptional coastal home! Takes six 60 max watt candelabra bulbs for a total of 360 watts. Comes with 6' of chain length.